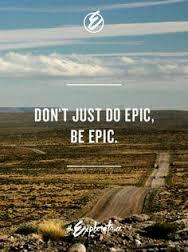 Epic-ness is not a word found in the English dictionary, I think it should be, it is an awesome word that can be well defined. When we use the word epic it is naturally to describe a person, place or thing that we consider on a grand scale, clearly something monumental or legendary. Perhaps we could use epic to articulate and express something that might be quite venturesome and adventurous. Of all the words used to describe my journey through this life experience so far, epic it is! What about you, how do you define how your soul has traveled up to now? It is easy to instantly revert to thinking about all of the hardships, heartbreaks and difficulties, our ego does a good job of locking us in to thinking negative without a doubt. What about all of the amazing and wonderful memories you have gathered so far, how many exciting and brave adventures have you experienced, how many times can you say to yourself, ‘I’ve had some crazy and exhilarating times in my life’! There is no doubt that each of us in our own way seem to experience one challenge after another, ‘there is always something’, those words ring through our ears from time to time, life can certainly have it’s highs and lows. When a situation comes along that knocks you to your knees, or you wake up in the mornings with a frown having to face another day at a job that is less than ideal, or maybe there are times when you feel completely alone inside, I believe a good remedy for all of the above (and more) is to draw your attention back to a time when you experienced something epic in your life. Focus on your happy and positive memories, our physical and mental bodies react instantly to happy thoughts, everything feels and seems so much better when we do. Our world is perilous today, uncertain, insecure and vulnerable, the energies circulating around us are precarious this we know, but what we can do to help raise those negative energies is with positive thinking. It might sound ridiculous or even fantasy, thinking that just one happy thought can make a difference, but I know it can. Make up your own little mantra, maybe include the word epic or some other adventurous word to describe your own joyful ride on this crazy planet, have a laugh while you remember, thinking back is not always a negative thing to do.